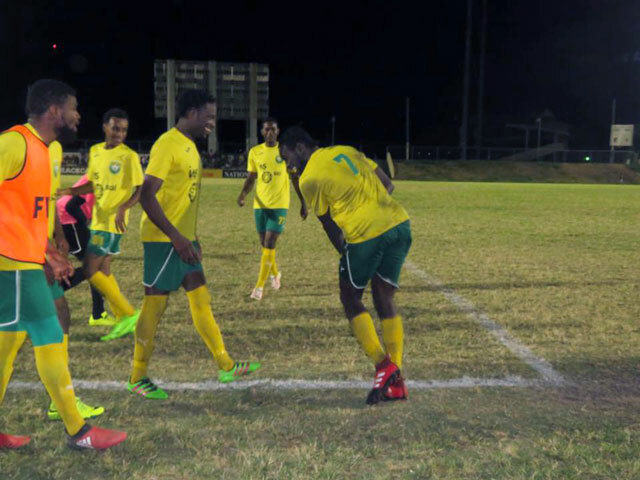 Basseterre, St. Kitts-So Island Auto Conaree are Easter Cup Champions of the St. Kitts and Nevis Football Association (SKNFA) following an epic comeback against the Garden Hotspurs on Saturday evening at Warner Park. Both teams got to the final after they dispatched their opponents on Thursday evening. Conaree had a 1-0 victory over Cayon while the Spurs team needed penalties to advance over the Village Superstars team. However on Saturday night it was the Conaree team popping champagne as they emerged champions in a 5-2 victory in what many are describing as one of the best games of football played at Warner Park. The game started horribly for the Conaree side when their Kadeem Lewis was left red faced after he put the ball past his own goalkeeper nine minutes into the encounter. With a 1-nill lead under their belt the spurs team looked comfortable for most of the game and had ample opportunities to add to their advantage. However with time running out in the game the spurs team adopted a defensive approach to try and hold on to their one goal advantage. The Conaree team refuse to throw in the towel and were rewarded with a late equaliser through Lewis who recovered from his earlier error to send the game into extra time with his strike in the 87th minute. With momentum on their side in the added period Conaree took an early lead through Lewis again who popped in the box to finish with his head and give his team a 2-1 lead. However spurs was given a lifeline when Conaree lost Errol O’loughlin through a red card. The resulting free kick was put in the back of the net by Marlon Martin to put the game level. In the second half of extra time is where the wheels came off for the spurs team as they failed to make the man advantage pay off and was put to the sword by Javen Matthew who added two goals and propelled the Conaree team to the title. Coach Isiah Morris of the Conaree, gave members of the press his thoughts on his team’s performance. “Tonight Conaree would have demonstrated that they wanted the Easter Cup more than their opponents. We started a bit late and a bit slow and we gave up a goal which to me was a soft. During the half halftime interval, I told the guys to trust themselves and trust each other,” he said. He added that this was the only SKNFA trophy he had yet to win. Morris was also asked if he ever lost hope that his team would get the equaliser and admitted that he could not see where the goal would come from but knew he had it one when they were going to come out on top. The SKNFA General Secretary commenting on the game added that it was probably the game of the season and that the crowd had definitely gotten their money’s worth. The defeat means the garden hotspurs team has lost the finals of both the Carnival and Easter cup competitions. The football season will continue with the FA Cup Quarter finals and the resumption of the Premier League.